Astronomy is fascinating and thanks to Celestial Dynamic’s Cosmic Watch, you can learn more about it and keep track of time in an interactive and innovative manner. Cosmic Watch is a remarkable app that combines mathematics and geometry to deliver a unique timekeeping experience on your mobile device. Swiss tradition and expertise when it comes to timepiece technology are renown around the world, so it comes as no surprise that the Cosmic Watch was developed in Switzerland. That being said, the Cosmic Watch is more than a clock. This app serves as an astronomical tool that allows you to explore the movement of the sky and celestial objects, and to learn more about the coordinates used in navigation. 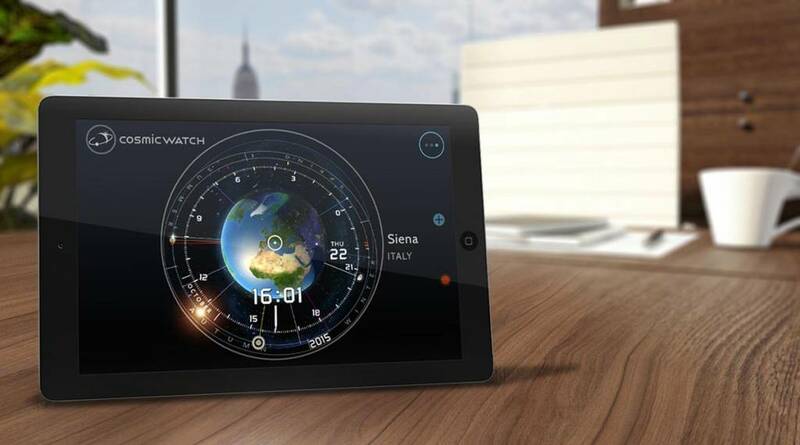 The first thing that will impress you about Cosmic Watch is its beautiful, eye-catching interface that features amazing 3D graphics. The app offers an engaging learning experience that will help you to become familiar with astronomical concepts and the principles that determine the relation between time, the cycles of our planet and the solar system. Once you launch the app, it will rely on your device’s time and location and it will show you a 3D globe of the Earth. The 3D graphic representation focuses on your location and it offers a realistic and stunning vision of our planet. You can easily explore the graphical elements by rotating and zooming in using simple one, or two finger gestures. The Cosmic Watch offers a simulation of the celestial sphere. This is an amplified model of the sky where you can see the position of the stars, the sun and the planets in relation to the Earth. It can be used for orientation and to find the location of celestial objects. The app can tell the time of sunrise and sunset with great precision and it also provides accurate information about solar eclipses. The Earth’s tilt and the variable speed of its orbit around the sun are also presented in a visually appealing style. You can tap anywhere on the globe to see the local time in that area of the world. 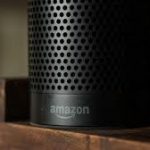 It is also possible to access a database that contains over 15,000 cities and large towns and you can save up to three locations to your favorites list. From the Home Screen it is possible to access the three main modes available: Clock Mode, Astronomy Mode and Astrology Mode, using the icons that depict a digital clock, stars and planets. When you launch The Cosmic Watch, the Clock mode is loaded by default and it shows the Earth, with the sun, moon and planets around it. 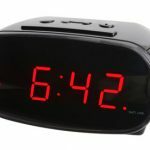 The Clock mode displays local time digitally in a 24-hour format, showing you hours and minutes. Your location is obtained via GPS and the time appears on the globe of the Earth and around it, there is a circle that marks the ecliptic. 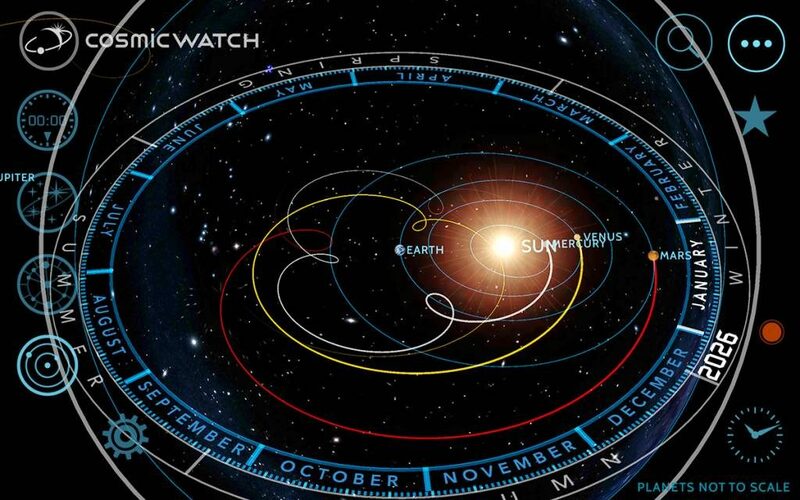 This is the apparent path of the sun on the celestial sphere during a year. There is a 24-hour clock dial following the ecliptic and it is synchronized to the noon-time sun and has a clock hand that points to the current local time. In the celestial sphere, you can find the stars and if you tap on the gear icon located at the lower left side, the settings menu icons are displayed. In the clock sub-menu, you can add a separate ring showing a calendar with the moon, the planets and the sun on their current position and another ring is used for the seasons. To find out the approximate local time for any place on Earth, you can rotate the globe by swiping the screen right, left, up or down. You can get the exact time of a specific location by tapping on it. In the Astronomy Mode, you see the celestial sphere surrounding the Earth and the stars, constellations and the galaxy are all projected into this dome of the sky. The names of the constellations and bright stars are included, with lines connecting the star patterns. The constellations are presented backwards, giving you a “God’s eye-view” so you will see them as if you were looking down from outside the celestial sphere. The planets are displayed in the right position in the sky and small planets can be found through color-coded rods that connect that connect them to the center of the Earth. In the Guides sub-menu, you will find some interesting additional features. The equatorial coordinates grid is one of them. It is possible to enable the observer’s horizon ring along with direction labels and then you can activate the compass on your device so that you can align the app with true north and use it to find the direction of objects in the sky. If you turn on the Celestial Rings, you will get access to the app’s virtual armillary sphere and you will see the center of rotation and direction of motion of the Earth, as well as the equator and tropics rings. In the Astronomy Mode, you can also tap the Settings (gear icon) and then Solar System to access the digital orrery. This virtual orrery represents the motion of the planets in the solar system. It allows you to see the way in which the bodies have moves throughout the years. While the display focuses on the Earth and it shows the motion of the planets in relation to the Earth, an heliocentric view is set to be added in the future. The final mode, is the one related to Astrology. Here you will see the planets, the sun and the moon with their astrological sign. The houses of the zodiac are presented in a ring divided in 12 zones and you can see where the sun is at any time of the year. You get clear visibility of the amount of time that the sun remains in each house. If you are into Astrology, you will love the fact that Cosmic Watch is also a practical option to create birth charts and other reports. 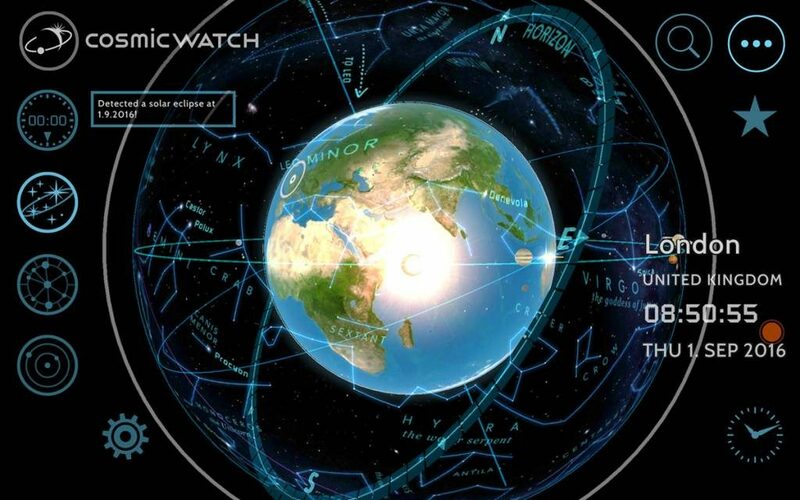 Comic Watch is a beautiful educational app for astronomy fans and it stands out from other options, thanks to the fact that it allows you to see the Earth and the solar system from afar. It provides stunning views of the passing of time and the changing light around the globe, from an astronomical perspective. 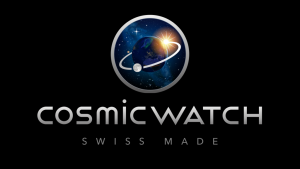 The Cosmic Watch is available for Android and for iOS for $4.99.